With Valentine’s day right around the corner, you may have chocolate on the brain. Don’t worry. 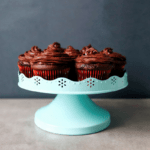 I’ve got your chocolate cravings covered with these Low FODMAP chocolate cupcakes. You should probably know that I’m a chocolate fiend. This probably explains why these low FODMAP cupcakes were one of my first Franken-FODMAP projects. I bet they’ll be a family favourite at your house, too. If you like the sound of these low FODMAP chocolate cupcakes, but you don’t have time to try them now, PIN THIS POST for later. It’s ridiculously easy to keep these chocolate cupcakes low FODMAP. With a few tweaks, we’ll curb those chocolate cravings in no time. Check out the notes below for some tips on keeping these tasty treats FODMAP friendly. First up is flour. If you’re in the elimination phase of the diet, you’ll need to use a gluten-free flour. For my Canadian peeps, I use PC’s all-purpose gluten-free flour. I like it because I can use it cup for cup and it doesn’t have any gums. If you’re in the elimination phase of the diet, you’ll also need to use lactose-free milk. I normally use 1% because that’s what I generally have kicking around. The fat percentage doesn’t matter, though, so you can use whatever you have handy. Next up is cocoa powder. According to the Monash app, cocoa is safe in servings of 2 heaping tsp. Monash recommends avoiding servings of 5 heaping tsp or more. This amount is high in fructans and galactooligosaccharides. Our recipe uses 3/4 cups of cocoa in total. That works out to 3 tsp per cupcake. Since there is also some cocoa in our chocolate ganache icing, I recommend sticking to one cupcake per sitting. Speaking of icing, you’ll also need to find some low FODMAP chocolate chips. I use Enjoy Life’s vegan chocolate chips. They’re made with coconut oil and cocoa powder and they work really well for baking projects. Steer clear of chocolate chips that use milk or “milk solids.” These have lactose in them and aren’t safe in the elimination phase of the program. Last but not least is coconut milk. Monash recommends a maximum serving of 1/3 cups per sitting. Our recipe uses 1/2 a can of coconut milk which works out to 1.3 tbsp per cupcake. This is within the recommended range. If you think this recipe sounds great, make sure you PIN IT for later. Need a FODMAP friendly treat to curb those chocolate cravings? 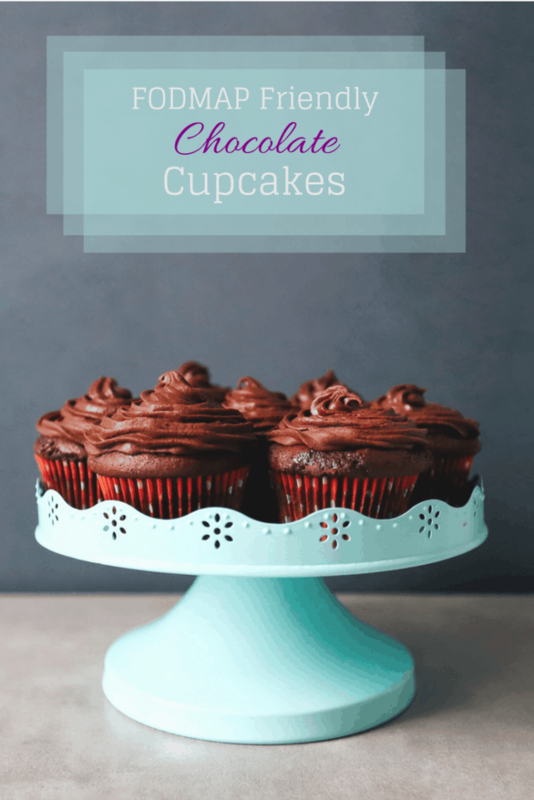 Try these low FODMAP friendly chocolate cupcakes! Rich and delicious, these cupcakes will be a family favourite in no time! Preheat oven to 350 degrees and line or grease 12 muffin cups. In a medium-sized mixing bowl, mix together gluten-free flour, baking soda, baking powder, cocoa, and salt. Set aside. Cream butter and sugar together in a large bowl until fluffy. Add eggs one at a time. Add vanilla and mix thoroughly. Alternate adding flour mixture and lactose-free milk to batter, mixing gently in between. Fill each muffin cup 3/4 full and bake for 15-17 minutes - until a toothpick inserted into the center of a cake comes out clean. Cool completely before icing. Heat coconut milk in small saucepan over medium-low heat. Stir frequently until small bubbles form around the edge of the pan. Place vegan chocolate chips in a heatproof bowl. Pour warm coconut milk over chocolate chips and stir with a spatula until all chips are melted. Cover the bowl with plastic wrap and allow the mixture to cool at room temperature for 2 hours, stirring every 30 minutes. Apply to cupcakes using a piping bag or a knife. I hope you enjoy these low FODMAP chocolate cupcakes. If you like this recipe, sign up for my mailing list below. You’ll get new recipes and articles delivered right to your inbox. You can also follow me on Pinterest for even more low FODMAP recipe ideas. Together we’ll get the Low FODMAP Diet down to a science! These. Are. Delicious. Soooooooo fudgy. Thanks for the personal cupcake delivery, Amy! Thanks, Hanna! And congratulations on being the first comment EVER! I love these soo much!! I can’t eat gluten and while there are lots of gluten free alternative cupcakes I often find they just don’t quite compare to the REAL deal.These ones are different! I don’t know if it is the chocolate chunks or the spot on consistency but these ones are so so good! Thanks, Joanna! I’m really glad you like them. One of the best chocolate cupcakes I’ve ever had! So moist and rich and yummmmm! Thanks for your comment! These cupcakes are super moist which is unusual for a gluten-free cupcake (I find a lot of them are too dense). If you’re looking for an extra dose of chocolate, you can also add low FODMAP chocolate chips, but you didn’t hear that from me! Size of bag of vegan chocolate chips? Size of can of coconut milk? Coconut milk or coconut cream? I recommend using Enjoy Life vegan chocolate chips which come in packages of 255 g – 283 g depending on whether you get the “chips” or the “chunks.” Either is fine for this recipe. This recipe also uses coconut milk (not coconut water which is high FODMAP or coconut cream which hasn’t been tested by Monash University yet). A standard can of coconut milk is about 400 ml. Does this work better with dutch processed cacao or natural? I use dutch-processed cocoa powder for my projects.